All of Julia Donaldson’s books are lyrical, the rhyme and the rhythm add so much to the stories, turns out she loves singing and drama and puts on a truly amazing show. You can take a peak at her performing her songs on YouTube… Really fun stuff for kids who are into drama and singing, and bringing books to life. Julia Donaldson will be performing in Cape Town and Johannesburg in early February, Cape Town details are in the first image for the post and Johannesburg details are below. 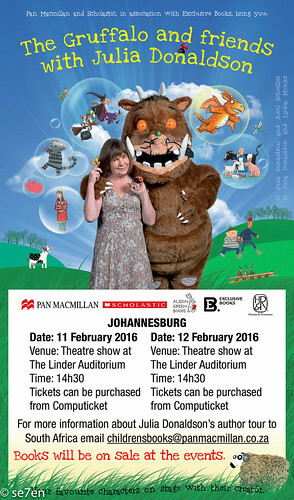 Thanks to Panmacmillan South Africa, who have brought Julia Donaldson out for us all to enjoy, we are looking forward to attending one of the shows. Now that is exciting! Hope you are going. 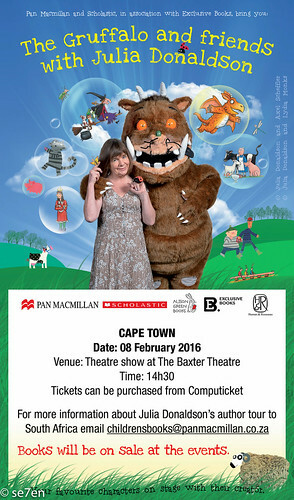 Hay Cheryl, I know… can you imagine an actual real live Julia Donaldson show in Cape town… We are there for sure!!! Can’t wait!!! Hope you have a great week!! !